Mediterranean, and nearby Atlantic coast (Spain, Portugal, Morocco, Angola). Bay of Algeciras, Strait of Gibraltar, southern Spain at 25 metres. Associated with Veretillum cynomorium. 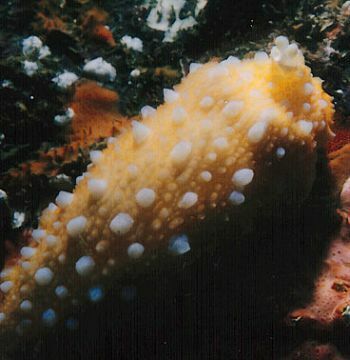 La Seca Reef, Sandy bottom, 30 mm long. Photo: Alma Sánchez. Grows to approx 130mm long. Body yellow orange with opaque white rounded and conical tubercles. It burrows in the sand during the day, emerging at night to feed on the pennatulacean 'Sea Pen' Veretillum cynomorium.